Whether rolling shutters, awnings or Venetian blinds - with the GEIGER AIR products, every sun protection is Smart Home Ready. 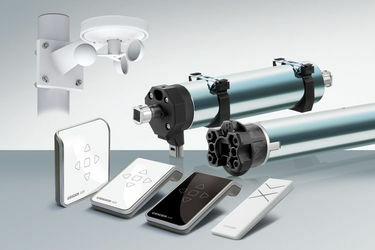 The manufacturer now offers the innovative AIR radio system for a Venetian blind motor and for a weather station. All the components around the sun protection can be integrated into the Loxone Smart Home Automation and networked with additional house technology. A thinking sun protection means more comfort, more efficiency and more time for the users. With the GJ56 .. AIR and the new weather station AIR, GEIGER is completing its portfolio around the Smart Home control system from Loxone. In addition to the universally applicable tubular motor SOLIDline Flex AIR and the SOLIDline Sun AIR for cassette awnings, the product family also includes various hand transmitters. With the support of the new weather station AIR, all sun protection elements can be easily controlled. The weather station operates both in stand-alone mode and integrated into the Loxone system. Installed as a standalone, the sensors measure rain, wind and brightness and transmit the information to the controls. As a result, the sun protection elements are used depending on the weather: when exposed to strong sunlight during the summer, they close automatically to prevent overheating of the rooms. In the wintertime, they let the daylight in. In case of rain or wind, the sun protection elements move to the upper end position in order to avoid damage. Different wind threshold values can be set as required. The new GJ56.. AIR Venetian blind motor is based on the extremely successful tried and tested GJ56 .. from GEIGER. It has an additional feature that allows the user to define an intermediate position with freely adjustable slat angle - no matter from which direction the blind runs to the intermediate position. By means of the semi-automatic adjustment, different slat angles can be compensated during UP/DOWN runs. The intermediate position can always be adapted by the user.